This book aims to provide insight into the "soft" side of real estate research and the interesting results and implications of the real estate research outside the traditional realm of investment/financial aspects. The book also attempts to answer what constitutes the so-called "soft-side" of real estate research if we shift our focus from the usual financial returns and investment analysis. 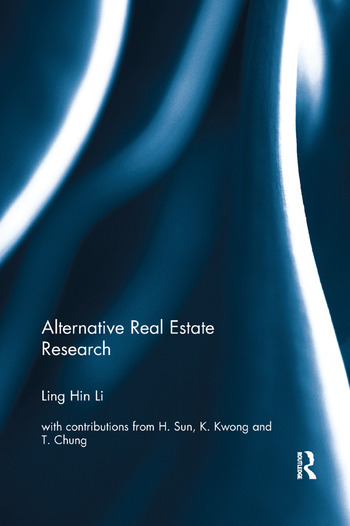 It also attempts to address whether there is such thing as an alternative real estate research paradigm. The book also argues that research in real estate should not only be limited to land and property market performance analyses as this may greatly impair the potential research implications of various real estate studies. The book argues that such analyses take on a very myopic view of real estate research. This book will interest many who wish to learn more about the alternative aspect of real estate research which is more than just about investment analysis. Ling Hin LI is Associate Professor and the Deputy Head of Department at the Department of Real Estate and Construction of Faculty of Architecture at University of Hong Kong. He is also the Programme Director of BSc. in Surveying as well as he China Network MSc Programme at the university. Ling Hin was Fulbright scholar in 2005. He was also Visiting Professor at The Institute of East Asian Studies, Lyon, France in 2004.